Tombstone, Arizona is as pathetic as a tourist trap can get, its inauthenticity reeking like drugstore cologne up and down both sides of the freeway. I’m not being cynical; I love a good souvenir stand, a notable place to snap a picture. But I like to be lured with finesse and charm, my debit card seduced from my wallet. Fool me, oh tourism board, into thinking I discovered this masterfully orchestrated corner of Leavenworth/Cannon Beach/New Orleans Square in Disneyland on my very own. We (me, my husband Matt, and my parents—the first out-of-state people to visit us in our new Arizona home) pulled into Tombstone last weekend on the way back to Tucson from a day trip. The townsite is capped on both ends by motels in various states of derelict horror movie readiness. As we drove in, we passed a graveyard completely walled off from the outside, creating a tour site for walking between the fading memorials of miners and settlers and gawking at one of the world’s most famous punny epitaphs: HERE LIES LESTER MOORE, FOUR SLUGS FROM A 44, NO LES NO MORE. If it had been up to me, my Corolla never would have parked. But it was my dad’s birthday, and he was leaving Arizona tomorrow, and as a child of the 1960’s the legends of cowboys and outlaws still sparked a childhood light in his heart. We agreed to take a picture of him in front of the O.K. Corral. “But we’re not staying,” we warned him, the man who passed me his need to seek out every souvenir stand. Walking down the main street was like trying to make it from one end of a mall to the other without getting hassled by a kiosk. Ghost tour? Mine museum? Stagecoach ride? “No thank you,” I said over and over with the tightest of smiles. The gunfight site, like everything else in town, was walled off and ticketed. Underneath the corral sign, directing people into the ticket booth, hung the words WALK WHERE THEY FELL. In 100 years, would this be Columbine or Newtown or the Tucson Oracle Safeway, a mile from my office, where Gabby Giffords was shot? How long was the half-life for a tragedy to become a sideshow act? I itched to leave this cynical town with a fervor that verged on panic. How sad and depressing must a place descend to sell every last grain of its history, to corner it off so that no one can so much as see without coughing up cash? Even the town’s one claim to fame not associated with murder and vengeance, the world’s largest rose bush, has been corralled and priced. Death seems to be an obsession of the desert, a place where the extremes of heat and cold can kill the unlucky and unsuspecting. It’s a new perspective for a person raised in mild green, where an intense summer meant keeping the air conditioning on for a few solid July days at a time. 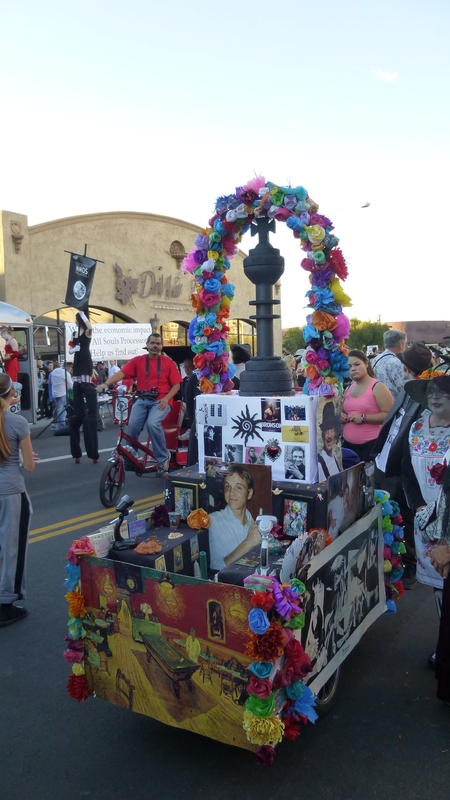 The month before I attended my first All Souls Procession in downtown Tucson, a community celebration of Día de Muertos. Like the daily gunfights and saloon girl parades of Tombstone, the procession began on an old street streaked in unshakable dust. The area quickly filled with men, women, children and dogs in costumes they could only get away with right here, right this minute. Death and joy mingled in the same breath—flower-covered altars to departed relatives and friends drowned in neon paper flowers, pulled by laughing mourners in skull makeup and shroud crowns. Marionette skeletons clinked martini glasses and flew above the crowd on strings and papier-mâché wings. Bands from Columbia and stilt dancers from California danced for the entertainment of thousands, free to all, charging only a price of reverence and peaceful assembly from all participants. Peeling away from the old streets of Tombstone, bound for Tucson, a fresh Southwest idea crept into my head. Maybe it isn’t death that we have to fear most deeply. Perhaps it’s the stagnation and desecration of the life we have here and all we fill it with. Our homes, our histories. For once you begin walling in your roses for the light and enjoyment of your world, what is left to live for?